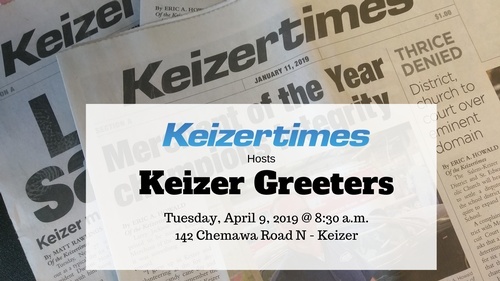 Our April 9th Greeters will be hosted by Keizertimes. Please join us to learn more about our local newspaper and its' role in our community from our very own Paula Moseley and Lyndon Zaitz. Dont forget your door prize for added exposure and to make a connection with a fellow member or guest. Free networking event for members and guests. We welcome and encourage guests to attend up to two of our events before we ask that they join in order to continue to enjoy this popular benefit of membership with the Keizer Chamber.